If you’re looking for paintball in Minnesota, you’ve come to the right place. Nobody puts on a better party than we do! You won’t have to worry about rain, snow, or extreme temperatures ruining your party because you’ll be playing on our 15,000 sq ft indoor paintball field. 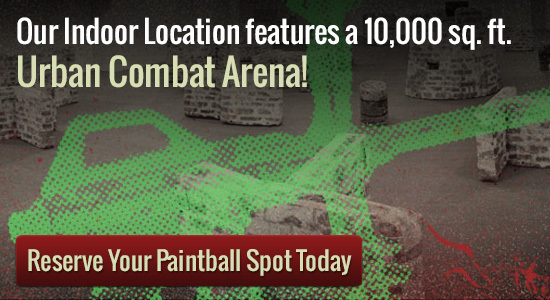 That’s right, we’re an indoor paintball field! Our entire facility is climate controlled. It’s never too hot or cold to play at Splatball. Do you have a reason to celebrate? As the oldest paintball field in Minnesota we’ve hosted thousands of birthday parties and bachelor parties, making us the paintball party experts. 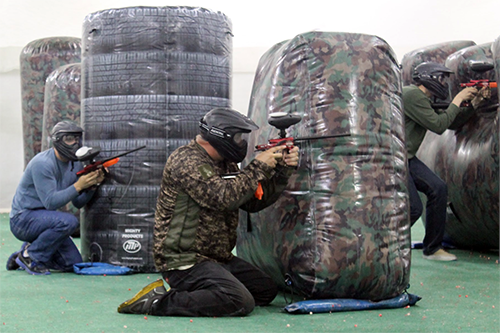 Our indoor paintball field has a party area that’s the perfect place for your celebration. You’re welcome to bring food and drink with you, or even a birthday cake. We feature a new format of paintball called low impact paintball. It’s a format specifically designed for new paintball players who might be a little worried about getting hit with a paintball. Low impact uses a smaller paintball and a lower velocity to reduce the impact of the paintball by 60% when compared to traditional paintball. We’re proud to be the first to offer low impact paintball in Minnesota. New players will also find we offer the best rental gear and options. We have everything needed to fully outfit a first-time player, at prices that won’t ruin your budget. Our basic rental package include all the basic equipment needed to play paintball–the mask, marker, and air tank. Other optional upgrades are also available such as chest protectors, padded gloves, and jumpsuits. You won’t find rusty cars or wooden spools at our paintball field. We use inflatable bunkers, known as airball bunkers on our field. These bunkers are safer and much easier to keep clean. You won’t have to worry about a guest at your party getting hurt sliding into one of our bunkers. Another great thing about airball bunkers is that they’re easy to move, giving us the ability to change our field layout on a regular basis. Every experience at Splatball is a new experience. If you don’t have enough players for a party, or would just like to mix in with a larger group, check out our walk-on sessions. We hold walk-on sessions throughout the week, making it easy for you to jump into a game of paintball anytime you want. Best of all, we separate our rental players from players who have their own guns, ensuring new players won’t have to worry about playing against more experienced players. It’s just another thing that sets us apart from other paintball fields in Minnesota. Still have questions about planning the perfect paintball party? Give our party planning specialists a call at 612-378-0385 and they’ll be happy to answer any questions you might have. Paintball in Minnesota is a superb choice if you’re searching for an exceptional time out with buddies. Paintball is fun for everybody involved and it is going to let you unleash your weekly aggressions in a single activity. At Splatball, our experts available are able to set you on the right track so you can have the best paintball experience. Regardless of season or how much experience you have, Splatball will be exciting for everybody. While Splatball does provide services for walk-on play, you can also come up with a group when you make a reservation. At Splatball, you can bring in a small group of eight individuals or schedule a larger group of up to 150 players. No matter how large or small you want your paintball battles, you are going to find everything is available for you at our facility, which gives you the most paintball scenario options around. For starters, even if you have never played paintball before, you are going to find it is incredibly fun. Buying all of the equipment can be expensive, especially if you haven’t done it before, but all of the necessary gear and equipment is ready and waiting for you at Splatball. Plus, we have compressed air fills and CO2 tanks, just to make sure you are always locked and loaded. When visiting, should you decide you like it, you can opt into season passes and other rental packages, all designed to give you the very best experience imaginable, no matter the event or people you wish to bring.